Some Utah leaders recant support; Bishop sees no other option; Lee wants Trump to quit race. Sen. Marco Rubio Al Hartmann | The Salt Lake Tribune Senator Ralph Okerlund, R-Monroe, Majority Leader, left, and Senator Stuart Adams, Majority Whip, R-Layton were among a group of Utahns who stood on the Utah Capitol steps Monday Feb 22 to announce Utah's formation for the Donald Trump campaign. 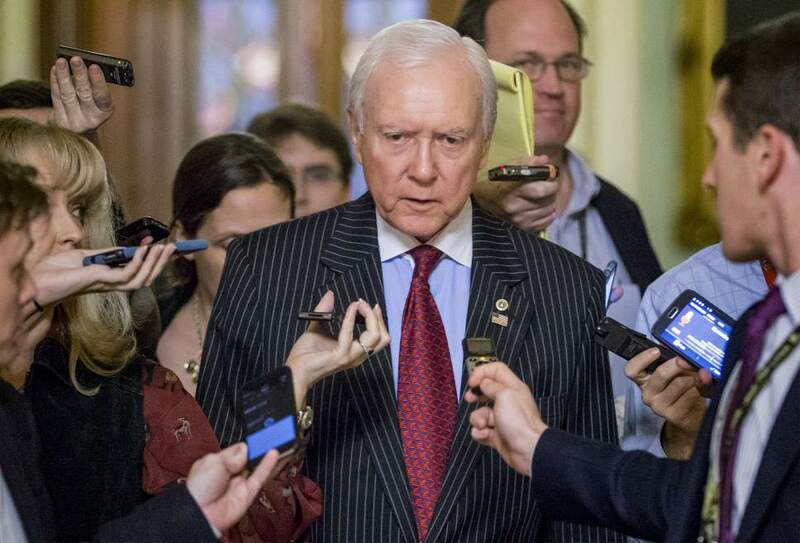 J. Scott Applewhite | AP File Photo Sen. Orrin Hatch, R-Utah, says people should cut Donald Trump some slack on his comments regarding Judge Gonzalo Curiel. Leah Hogsten | The Salt Lake Tribune l-r Senator Mike Lee joined Representatives Chris Stewart and Rob Bishop on behalf of GOP congressional candidate Mia Love at the Utah Republican Party headquarters, October 22, 2014. The congressional delegation wanted to voice their support for Love, encouraging citizens to ignore what they think is a negative characterization from her opponent. Al Hartmann | The Salt Lake Tribune Senator Ralph Okerlund, R-Monroe, Majority Leader, left, and Senator Stuart Adams, Majority Whip, R-Layton were among a group of Utahns who stood on the Utah Capitol steps Monday Feb 22 to announce Utah's formation for the Donald Trump campaign. 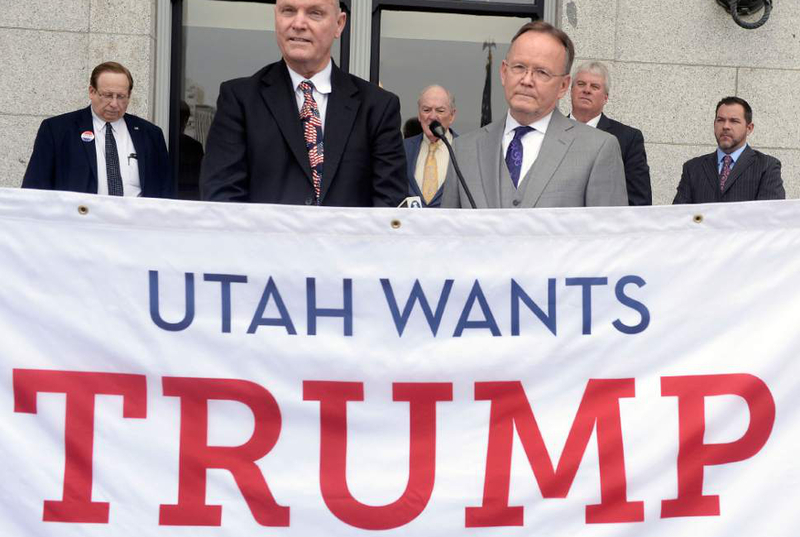 From his marital infidelities to his call for a temporary ban on Muslims, Utah&apos;s Republican leaders were wary of Donald Trump long before now. But most still plan to vote for him. For Gov. Gary Herbert and Rep. Jason Chaffetz, Trump caught saying his celebrity power allows him to do what he wants with women, including "Grab them by the p-y," crossed a point of no return. They rescinded their endorsements and won&apos;t vote for him. Trump initially responded to the controversy by saying it was "locker room banter." Chaffetz, who was a kicker for Brigham Young University&apos;s football team, has spent plenty of time in locker rooms and said "this is so over the top, it is not even acceptable in locker rooms. It shouldn&apos;t be acceptable anywhere. We are talking about the president of the United States. I want somebody of high moral values." Herbert called Trump&apos;s comments "beyond offensive and despicable" and, like Chaffetz, said he won&apos;t vote for Trump  but he also won&apos;t vote for Democrat Hillary Clinton. Rep. Mia Love was still wrestling with whether she should vote for Trump, but this video ended that. "His behavior and bravado have reached a new low. I cannot vote for him," she said early Saturday. "For the good of the party, he should step aside." 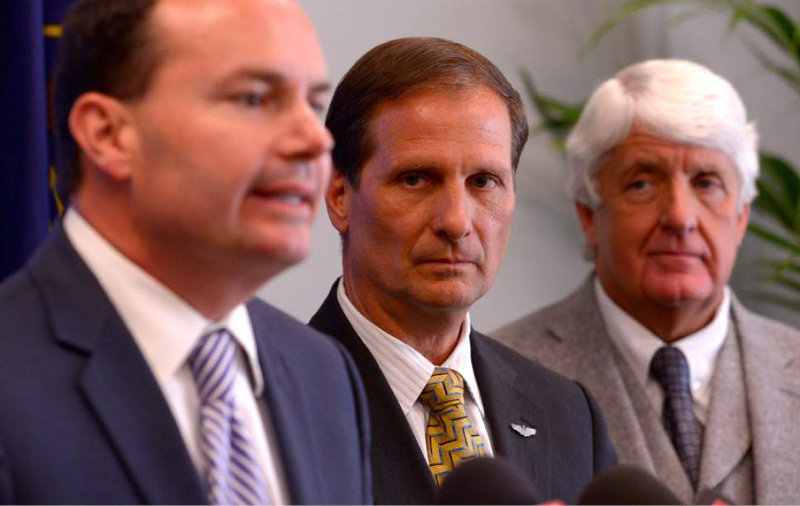 These three now join a small group of Utahns that includes Mitt Romney, the 2012 GOP presidential nominee, and Lt. Gov. Spencer Cox, who came to the same position well before this bombshell. 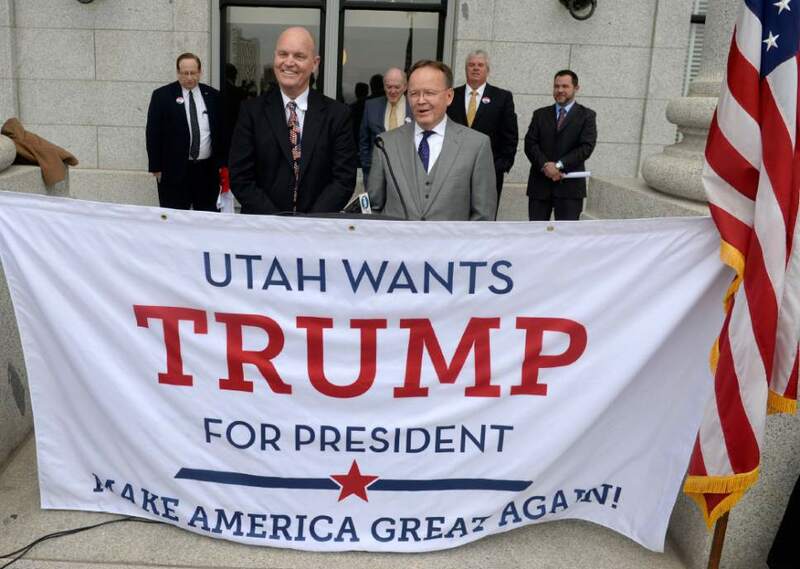 On the flip side is a group of Utah Republicans who, so far, are sticking with Trump. Rep. Rob Bishop, R-Utah, said the video "saddens me and again lowers the political rhetoric of this election year." But his choices are few. "Hillary Clinton is unacceptable as a potential president. Unless he resigns, I must support the Republican nominee as my only option," Bishop said Saturday. Sen. Orrin Hatch, state Attorney General Sean Reyes and state House Speaker Greg Hughes are among those who disavowed Trump&apos;s vulgar comments, which also included him saying he pursued a married woman "like a b." But all remain in Trump&apos;s corner leading into the second presidential debate, slated for Sunday. Hughes, who has been the most vocal Trump supporter in Utah, said: "To say I&apos;m disappointed would be a gross understatement." He added: "In the coming debate, there will undoubtedly be questions about what we learned today. My hope is that there will be a sincere apology and an accounting for these statements." Trump issued a short video on Facebook late Friday, in which he said: "Anyone who knows me knows these words don&apos;t reflect who I am. I said it. I was wrong and I apologize." Hughes said he was glad Trump released a response, but he didn&apos;t think that apology was sufficient. Reyes, who has campaigned on behalf of Trump in Nevada and Pennsylvania, said his comments were "unacceptable under any circumstance. They reflect a blatant disregard for the rights of women." But like Hughes and Hatch, Reyes said he was "disappointed," not that he is abandoning his party&apos;s nominee. Like Love, Sen. Mike Lee has refused to endorse Trump and been critical of his campaign, and yet hadn&apos;t ruled out voting for him, in part because of his opposition to Clinton. Lee issued his own Facebook video late Friday, at times talking directly to Trump, at times speaking to Republicans, saying it is time for Trump to drop out of the race, and let the party find another candidate with just a month to go. "It has occurred to me on countless occasions today that if anyone spoke to my wife, or my daughter, or my mother, or any of my five sisters the way Mr. Trump has spoken to women, I wouldn&apos;t hire that person," he said. "I certainly don&apos;t think I&apos;d be comfortable hiring that person to be the leader of the free world." He said Trump&apos;s nomination had forced conservatives to settle and that the campaign was now embroiled in distractions. "With all due respect sir, you are the distraction," Lee said addressing Trump. "Your conduct, sir, is the distraction." Lee wasn&apos;t sure who that new candidate would be, only that it was time to find one. And yet, even in this video, he didn&apos;t say that he wouldn&apos;t vote for Trump if he didn&apos;t drop out. That&apos;s the same stance taken by former Utah Gov. Jon Huntsman, Rep. Chris Stewart and state Senate President Wayne Niederhauser. Huntsman just a week ago said he was voting for Trump because he was better suited to boosting the economy and revamping campaign finance laws than Clinton. But he also has repeatedly decried "a campaign cycle that has been nothing but a race to the bottom." He called for Mike Pence, the governor of Indiana and Trump&apos;s running mate, to lead the ticket. It is not clear how that could happen with early voting already underway in some swing states. Ballots in many Utah counties, including Salt Lake County, are expected to be mailed out later this week. And Trump said he won&apos;t consider it in an interview Saturday with The Washington Post, which broke the story about the explicit video. Trump said: "I&apos;d never withdraw. I&apos;ve never withdrawn in my life." In that same interview, Trump criticized Chaffetz, though apparently without recognizing the Utah congressman is one of the primary Clinton antagonists in Congress. "Chaffetz should spend the same energy going after [Clinton] as he does going after the person who won the primary with a record vote," Trump said. Not Trump, not Clinton, but who? None of Utah&apos;s top Republicans is prepared to vote for Clinton, whom most of them treat with outright disgust. That leaves limited options, especially if Trump stays in the race. There&apos;s Libertarian candidate Gary Johnson and independent conservative Evan McMullin, both of whom have headquartered their campaigns in Utah. 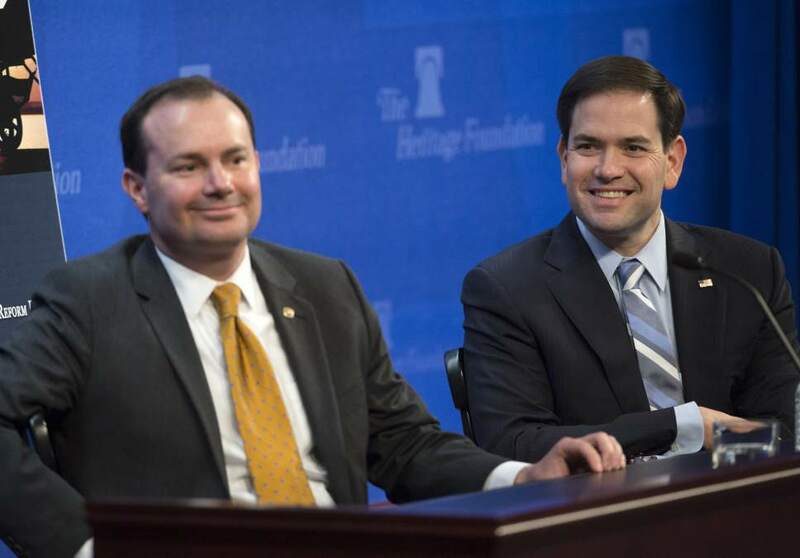 These two split the third-party vote in the last Salt Lake Tribune-Hinckley Institute poll from mid-September. Johnson got 13 percent and McMullin 12 percent. That left them far behind the major party candidates. Trump got 34 percent, an abysmal number for a Republican in one of the most conservative states in the nation, to Clinton&apos;s 25 percent. Eight percent said they intended to write in a name. Chaffetz isn&apos;t sure what he is going to do and even Romney, who announced his absolute opposition to Trump in March, hasn&apos;t announced how he is going to vote. Much of Trump&apos;s weak performance in Utah is due to the state&apos;s massive Mormon voting bloc, which has viewed him as crude and generally disagree with his hard-line stances on immigration, refugees and trade. The Trump tape is expected to drive down that support even further, but it is too early to suggest that it could turn Utah in Clinton&apos;s favor. But Utah Democrats are trying to seize on the controversy. "Our vote in this election is too important to cast based solely out of party loyalty," said Utah Democratic Party Executive Director Lauren Littlefield. "Donald Trump does not represent Utah values."  Former Utah Gov. Jon Huntsman is the brother of Tribune owner and publisher Paul Huntsman.